The Williamson-Russell-Rahilly House is a another great example of how historic homes change over time. 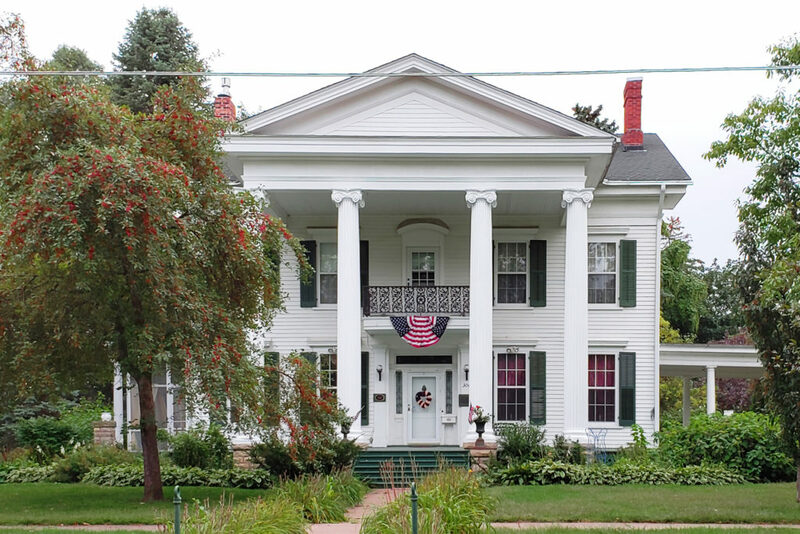 Similar to the renovation of the Augustine Hawley House in Red Wing, this grand home began in the Greek Revival style when constructed in 1868. Built for Harvey Williamson by carpenter John Stout, the home was renovated in 1910 by the third owner, Patrick Henry Rahill, in the Neo-classical/ Classical Revival style. The very first home that was built on site was constructed in 1855 by one of Lake City’s founders, Samuel Doughty. It was purchased a few years later by the city’s first postmaster, Harvey Williamson, however, it burned down sometime around 1867. Williamson took the opportunity to build a new home on its foundation in the Greek Revival style. It featured 6-over-6 double hung windows, engaged columns, two small porches, and a side gabled roof with simple open pediment and wood frieze. 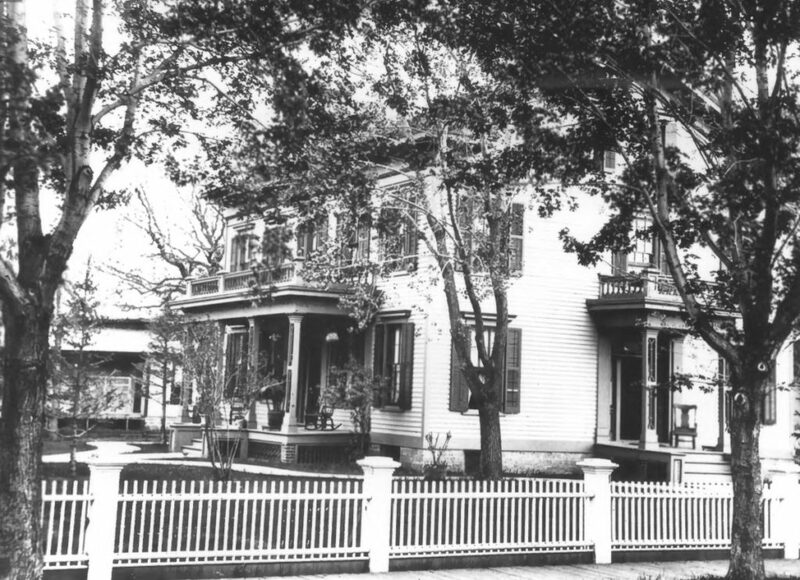 Williamson sold the home to Morris C. Russell circa 1882. Russell had an adventure type past. 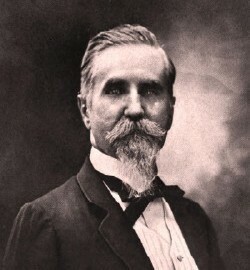 He was born in Pennsylvania in 1840 to a father who not only farmed his land but was the manager of his brother’s iron mines. From the age of 10, he worked on the farm, in the iron mines, and as a clerk in his uncle’s supply store. When he was 14, his father gave him permission to move to the Minnesota Territory, a wild region which 3 of his brothers had already moved to a few years earlier. It was on the Hamburg steamer, landing in La Crosse, that he survived a cholera outbreak that killed hundreds of passengers. Eventually arriving in Saint Paul, he worked for a few years as a flatboater, “polling” cargo up the rivers, and delivered the first piano into the Minnesota Valley. On one expedition with his brothers, delivering timber to Saint Paul from the Big Woods, his raft was windblown into a river bank due to spring headwinds. They spent a week living off bark, roots, and some spoiled herring until they were rescued. Russell was well acquainted with many of the local Indian chiefs and served as a Scout in the Sioux Uprising of 1862. In 1872 he founded The Brainerd Tribune, the first newspaper on the Northern Pacific Railroad east of the Rockies. A few years later, he was associate editor of Lake City’s first newspaper, The Lake City Leader, and then started this own paper, Graph-Sentinel. As for the house, he lived in it only a year, selling to the Buck family, owner’s of the city general store. It was in 1901, that the home was purchased by Patrick Henry Rahilly. He is best know for serving in the Minnesota House legislature for three terms, and as a State Senator for one. He is the reason for the home’s Neoclassical design seen today, commissioning local architect Charles Koch in 1910 to dramatically change the facade. 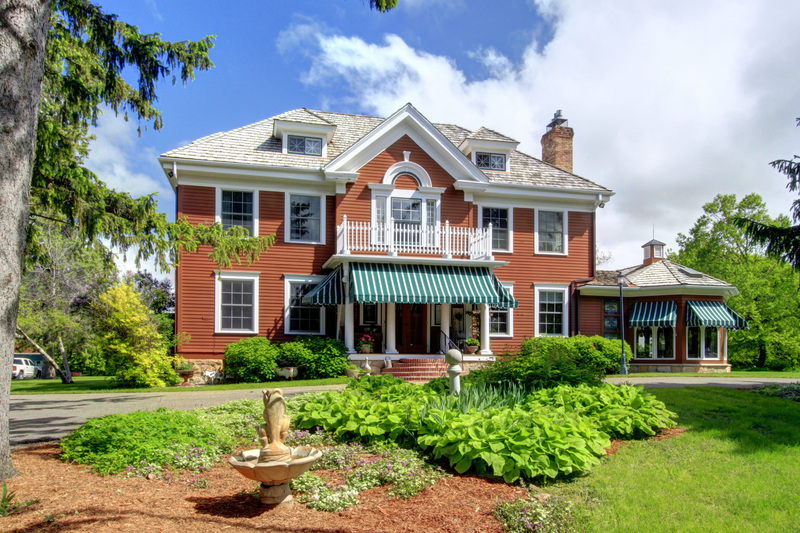 Four 30-foot Ionic columns were added under a fully pedimented gable to the front facade as was a porte cochere to the side of the home (among other renovations as well). The original elements of the interior remained, including five fireplaces, four of Italian marble and one of blue African marble. Woods found in the home are mahogany, quarter-sawn oak, and walnut. The home remained in the Rahilly family until 1963. When Hans Mattson immigrated from Sweden and founded “Mattson’s Settement” in 1853, along with other Swedish farmers, little did he know how his small town would hold so much hope for others. (He himself would become the Minnesota Secretary of State, serve in the Civil War, and become the United States Consul General of India). A decade later, after Reverend Eric Norelius founded the local Lutheran church, the true calling of the town began to unfold with the creation of what would become the first private children’s home in Minnesota. In 1865 Reverend Norelius learned of four children in St. Paul, recently immigrated from Sweden, that were orphaned and in need of care. Norelius brought them to Vasa and housed them in the basement of the Lutheran church. Not being adequate for long term living, he was able to purchase 10 acres of land a few years later near the church, and in 1869, built a small house for the children. This was the first of four homes to be used for orphans on the present day land. In 1876, a second larger house was built, but it was destroyed by a tornado in 1879. The third home, built with-in the year, was destroyed by fire in 1899 when a young child was playing with matches in a clothes closet. The Neo-classical styled home seen today was built in 1899, soon after the fire, and is the final remaining home built on this location. It ceased being a children’s home when a new facility was built outside of Red Wing in 1926, but through it’s years has witnessed and cared for hundreds of children. The home sat vacant for nearly 40 years, until a couple bought the home in 1968 and began restoring the property. 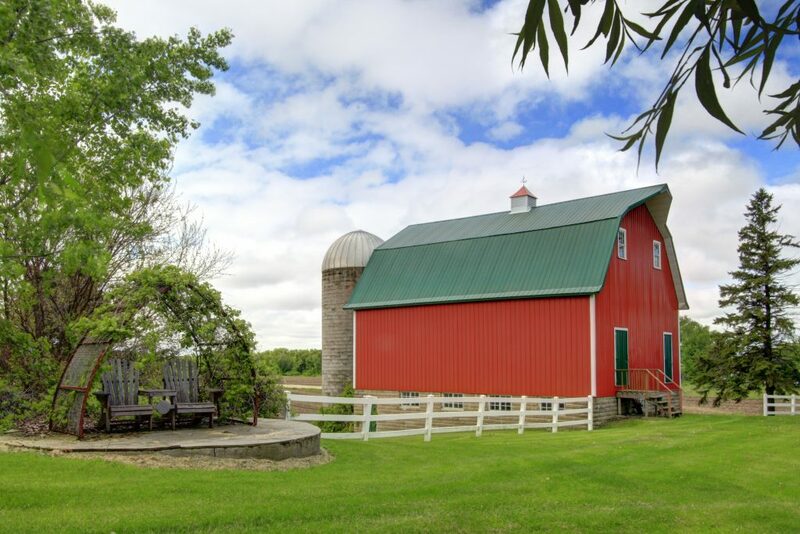 It currently is comprised of 2 parcels totaling 34 acres of woods, pasture, and tillable land. Further improvements have been made by subsequent owners since then, including the grounds, expansive gardens, the addition of a guest house, and more. Today, this historic home stands as a testament to the hard work of many to preserve it for future generations. 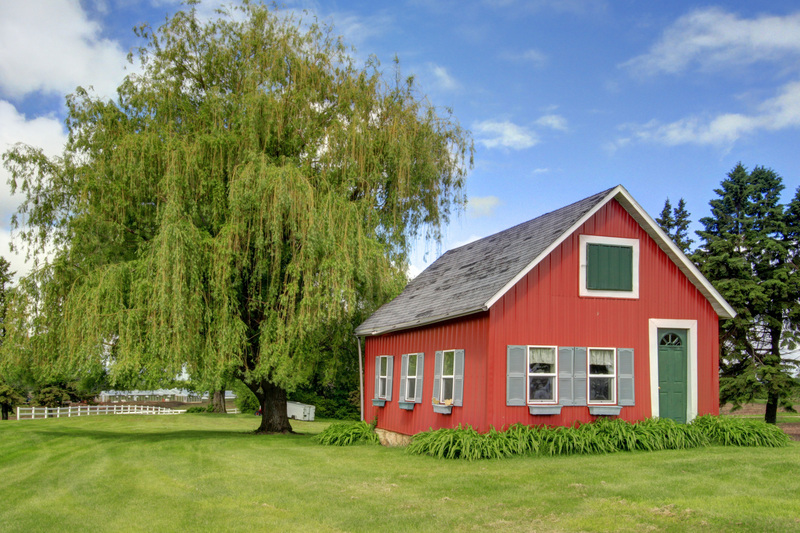 A few other structures that still stand and are original to the property include a small school house, barn and silo, and caretaker’s cottage. There are several building ruins on the site, too. One of the original barns and silo still standing. The home was placed on the National Registry of Historic Places, along with the Vasa Township Historic District, in 1975. It is currently For Sale with more photos and a 3-D interactive tour at the Property Website. The second children's home built on site. Second Children's Home destroyed by tornado in 1879. Fourth children's home, circa 1900. Photo of fourth home circa 1907 with school house in back of photo. Fourth home with children, windmill can be seen in back of photo.